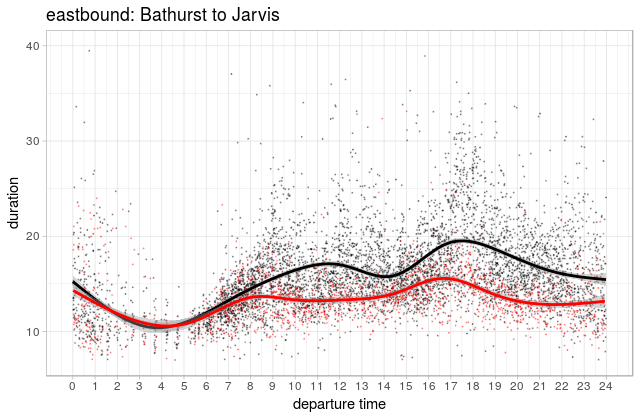 This entry was posted in Analysis and tagged City of Toronto, ggplot, Jeff Allen, King Street, Nate Wessel, PostGIS, QGIS, R, Toronto Transit Commission, TTC. Bookmark the permalink. It’s worth noting also that we’re only looking at in-vehicle travel times. If headway regularity is improved by the pilot, then actual travel times could be much more dramatically improved as people spend less time waiting on average. Hi Nate.I would love to see your data. How did you go about requesting it from NextBus? I’ll share the data here in a bit… it takes a bit of work to cut it down to a size that I can share easily. I live just outside of my the pilot zone and traffic on King St is down dramatically. Would be very interesting to see the analysis stretched 500m-1k in each direction beyond the pilot boundaries. Is there a loss of speed at Queen, Adelaide, Wellington, etc. Other streets somehow do need to pickup the slack or no? Greetings: As you probably know, I have been getting the CIS data from the TTC for some time and especially for the King and Queen corridors. In early December when I have the November info I will publish updates on the behaviour of these two routes. You mention a weekly periodicity in the data and that is something I have been seeing for a long time. Mondays are always the fastest weekdays, and of course there are no events in the entertainment district on those evenings. Travel times build up through the week both for daytimes and evenings. See https://stevemunro.ca/2017/07/11/travel-time-on-king-street-january-to-june-2017/ for some “before” data. I can’t wait to see your analysis of some of the post-pilot data. Once we have a few weeks of data ourselves, it may be interesting to look at some of those weekly patterns in more detail. Also, I’d love to know where you’re getting your historical data; I’ll follow up by email! 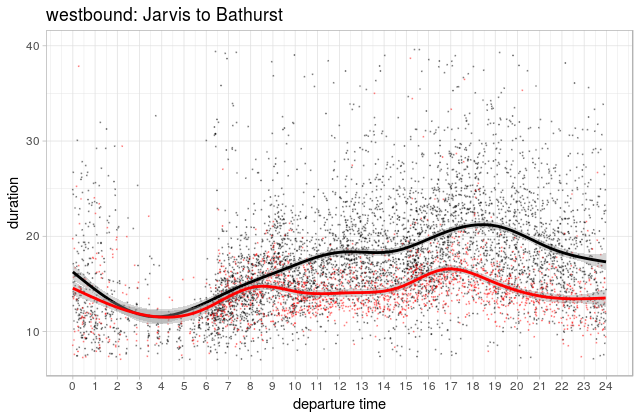 I have been getting CIS tracking data for selected routes from the TTC on and off for almost a decade. I get the raw data, not the NextBus feed. 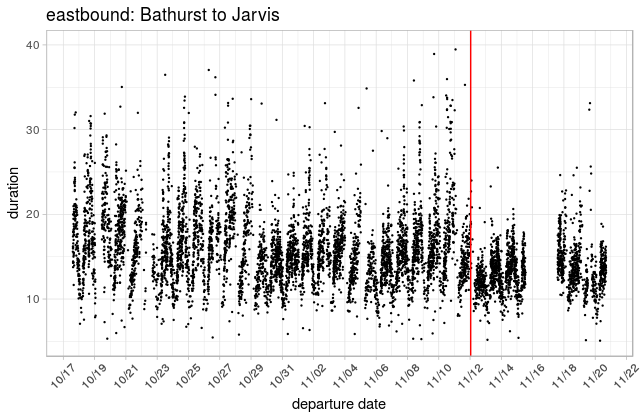 With respect to King and Queen, I have a particularly large amount of data over recent years as I have been tracking these both for my own interest and for work I did for City Transportation. If you want any of this, let me know. What do you guys think of it now, since enough time has been past ? I’m working on a thesis about this project and the whole idea of pedestrianization and/or giving higher priority to the pedestrians and pedestrian flow in downtown core. And I was wondering about your analysis, I’m looking to map or come up with some sort of diagram to change the traffic flow in the area of king street pilot, something that shows changes in more of a technical point of view, for instance, a traffic engineer point of view. How new changes affects traffic. Do you have any advice for me ? I have only been on the the street car twice since the change and both times my travel times for the same period dropped from 25-30 mins to 13-17 mins. That is with the driver/operator each time for reasons unknown to me travelling at 25-30km/hr when there was no traffic in front of them. They were probably trying not to bunch up on the vehicle in front of them, in order to maintain even headways. The remaining issues as I see them are — insufficient capacity, poor traffic light coordination and a lack of pedestrian awareness of the need for cars to turn right at intersections- plus of course on-going enforcement. The lack is space and frequency on the 504 at rush hour causes big slow-downs as passengers struggle to exit and pile on. And lots of people are left stranded as streetcar after streetcar goes by, too full to accept any more passengers. When streetcars are stopped for a red light, they have to stop again on the other side of the intersection where the stops are now. And then there’s pedestrians who keep walking across the road long after the countdown has started, preventing cars from doing the legal thing.. ie turn right. I have such high hopes for this project as a daily 504 commuter. But my ride home from work last night was really dispiriting. John street to Marion took about 50 minutes. I am curious — how does the before/after look if you confine it to only peak period?